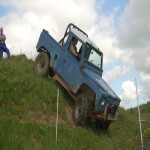 Been a few years since I attended a BORDC trial....in a chopped up lada!!! Where, I know where Rosarie is, will it be sign posted from the road? Can none members drive? Ive no problem joining but there's a guy wants to come with me and he's not keen to join for a one off event.